The Donauturm (Danube Tower) is the tallest structure in Vienna and offers guests and unparalleled view over the Austrian capital. The tower itself was built in an astounding 20 months, and was opened in 1964. For a small cost, visitors can take an elevator to the observation platform which sits 150m above the city. It is also possible to dine at one of the two revolving restaurants that are even higher, at 160m and 170m above the city. These restaurants revolve at varying speeds which offers visitors a 360 degree view throughout their meal. For a quick snack there is a cafe (which also rotates) serving Viennese specialties. Every year in November, the annual "Stair Run" where athletes attempt to run to the top of the tower in the quickest time. The record is 3 minutes and 19 seconds. Since the summer of 2008, it has also been possible to bungee jump from the viewing platform. 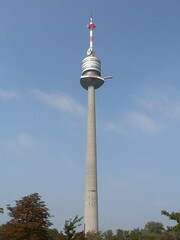 The Donauturm is located in Donaupark, just to the northern side of the river Danube. 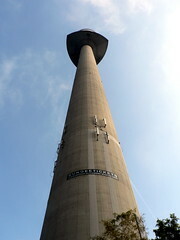 Be the first to write a review about the Danube Tower (Donauturm)! See below for more information. Have you already visited the Danube Tower (Donauturm)? If so, let everyone know what you thought about it by writing a review! No registration necessary. Just click here to start writing! 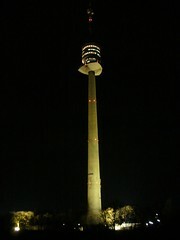 View all Danube Tower (Donauturm) Pictures.